On any given day, people utilize manners each time they interact with or are near another person, whether they realize it or not. While manners may be thought of as strict etiquette rules, people’s manners can really be as simple or as formal as a particular setting calls for them to be. Set etiquette rules are not evident in today’s society, which causes people to view manners as outdated. According to the Merriam-Webster dictionary, manners are “the social conduct or rules of conduct as shown in the prevalent customs.” Manners vary between places and time periods, but manners in 21st century America require less active input than ever before, meaning that American etiquette is more casual, and less work is required to interact with other people. Many people believe that manners are lacking as American society takes a downward turn towards complete disrespect and little self-awareness while others accept the social change as a new way of life. “In 1996, U.S. News & World Report surveyed Americans about the condition of civility in modern society. Of the 1,005 respondents, 89 percent said that incivility was a major social problem, and 78 percent said the situation had worsened in the last decade. Ninety-one percent believed that incivility contributed to violence.” When a society upholds a set of manners, it promotes a level of respect and understanding for others. Without “civility,” the society lacks solidarity, leading to a disconnection between the single person and the community. Participants in the U.S. News survey logically believe that incivility leads to violence because the attacker has little or no respect for others. As time goes on, the level of civility continues to travel down the slippery slope towards incivility, unable to restore proper manners and respect to society. Particularly dinner table manners have changed over time and are almost nonexistent today. Cultural changes and new technologies are each contributors to the change in manners from Colonial times, to the mid-twentieth century, until today. The term “manners” encompasses nearly any interaction between a person and other members of society, but one particular situation which affects every human is dinner table manners. Since the beginning of time, humans have relied on food for survival. Food often brings people together for special occasions or simply for everyday meals. As meals are shared, certain etiquette is expected as a courtesy for others present. Benjamin Franklin wrote in Poor Richard’s Almanac, “Good sense is the foundation of good manners.” While this statement is true, customs change over time and vary between places, but are still expected to be followed. Particularly in America, cultural factors such as wars and industrialization have affected the way people interact and share meals, thus altering acceptable manners. Manners can be viewed as a form of technology in the sense that the term “technology” describes the way humans utilize tools. People use their bodies as tools to communicate nonverbally. One can manipulate their posture to convey different body languages in accordance with what is socially acceptable at the time. Certain protocols have been established for body positioning while eating, such as cutting with a fork and knife. Following such guidelines convey respectable manners and politeness. People adjust manners as times change and the culture shifts from one occurrence to the next. Many cultural revolutions have taken place in America which have affected dinner table etiquette. “A social code, like a garment on the human body, outlives its usefulness when it no longer fits the form for which it was designed.” Dinner tables in the 18th century vary drastically from dinner tables today and would no longer “fit the form for which it was designed.” Following Colonial American etiquette at a dinner table in the mid- twentieth century would seem too elaborate. Even the change of fifty years between the mid-twentieth century and the present shows many major differences. Wartimes have played a big part in the progression of dinner table settings and today there are many more options for eating both in the home and out at restaurants, which were not available in previous time periods. The practice of etiquette reached its peak in America during Colonial times. Writing a “courtesy guide” was considered chic and even President George Washington wrote “Rules of Civility and Decent Behavior in Company and Conversation.” These guides were written by confident upper class people for self-conscience members of the middle class. The writers were seeking the level of the upper classes from their former home in Europe. The upper class American people wanted to recreate the sophisticated level of living of the European upper class, but many middle to lower class people were not familiar with the upper class way of life, so they wrote manuals on how to act. France had set the standard of manners dating back to chivalry, so the British as well as the rest of Europe followed their lead. In Colonial America, almanacs also included advice on manners, but most adults had already formed bad habits and could not adapt to the changes. Children were taught maxims from almanacs and books such as George Washington’s, such as, “Spit not, cough not, nor blow thy nose at the table, if it may be avoided,” and “Put not another bit into your mouth till the former be swallowed.” Even from an early age, children became familiar with using their bodies as technology. Unlike today, they were taught about the messages their body sends with certain actions and postures and how to act politely towards elders. Southern Colonists were the most polished of the American Colonies. Landowners had vast plantations resembling those of England. In further efforts to recreate their British lives, they followed strict etiquette. One Virginian, William Fitzhugh, spoke the voice of many others when he said that his children had “better be never born than ill-bred.” This statement expresses the importance people placed on social behavior and manners. After the colonial period, the importance of manners continues to shift to accommodate the changing times. As the 20th century began, French cuisine became fashionable among upper class families. To have a French diet communicated to others the well-off financial state of the family. Until the 1960s, most upper class families had servants to help prepare food. Servants were especially important during parties. Preparing and serving several courses was quite a challenge, but servants of wealthy families were accustomed to the extra work. In this setting, the maids prepared and served the food, while the adults were highly respected heads of the household. Not having to prepare meals granted the parents time to train their children to have proper manners. The wealthy families would get to eat expensive French cuisine, and it was important to act as classy as they proved to be. The family dinner arrangement changed over the course of the 1900s, but dinner table manners remained highly valued. In the 20th century, particularly World War II, people became exposed to foods from different cultures. French food was the classiest and most flavorful, and indicated the wealthy status of the family. Etiquette at the dinner table would be especially important to these families because they were wealthy and valued upper class behavior. Not many nutritious options were available for lower income families, but as commercially processed food became available, prices became more affordable. Before the 20th century, canned foods were produced as a new method to preserve foods for a long period of time. This offered somewhat of a better selection for people to eat as opposed to food they had grown in their own fields. With the improved shipping system in the 1900s, commercially processed foods allowed for more fresh choices for people. Meats, breads, and fruits and vegetables could be shipped across the country in a faster time, so consumers could have fresh products without growing them themselves. 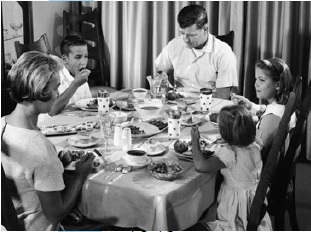 The early to mid-twentieth century changed the dinner table dynamic because many families were affected by the wars. Men went to war, leaving their families at home. Women benefitted from the technological advances as food became easier to obtain and more options were offered to families of all wealth statuses. They could afford to feed their children for less money, and became the prominent leader of the house. Meal time was an important gathering time for a family whether or not both parents were present. Manners were highly important, however they were less formal than those practiced in Colonial America. Since the twentieth century, even more food options have become available with the rapid spread of restaurants, which lessened the concept of the family meal. Today, fast food chain restaurants line America’s streets, increasing health risks and demoting the value of a shared family meal. In the late 19th century and early 20th century, “fast food” became available to the public. Restaurants were opened in cities, catering businesses started, and lunch carts opened on the streets. Ice cream stores, cafeterias, and self-service restaurants also changed the way people ate. They no longer had to rely on their maids or themselves to cook meals when they could be served elsewhere. McDonald’s restaurant started in 1955, which is more accurately regarded as “fast food” today. As the chain has grown over the past fifty years, it is evident that manners have declined as well. Whereas families used to value sharing meals at home together, there are now unlimited options of where and what to eat. The importance of gathering for dinner has been lost on most families, and manners have been lost as well. In the eyes of most people, going to a fast food restaurant or some other quick food place does not demand as much respect as a home cooked meal. Beginning with this concept, the manners continue to weaken. Today, the general population has a lowered threshold of embarrassment, so attention to dining details is less important to most people now than it was in years past. However, writer Judith Thurman also believes the threshold of common sense has declined just as rapidly, and so etiquette guides are still prevalent. People have lost the sense of pride that comes with acting respectfully and politely at the dinner table, which once governed households in America. While technology has rapidly increased in other forms of communication, body language has been lacking in modern society. People still communicate nonverbally with their body language, they just care less about the message they are sending. Manners have been transformed over the years from a critical focus of meal time, to barely a concern for family dinners today. Through many cultural effects, etiquette has fallen to less of a priority, but can still be found in the homes of many people. While many aspects have changed, the fundamental ideas remain, which means that body language conveys messages even when words do not. Keiger, Dale. “Are We A Nation of Boors?” Johns Hopkins Magazine, June 1998. Schlesinger, Arthur M. Learning How to Behave. (New York: The MacMillan Company, 1947), 15. Schlesinger, Learning How to Behave, 4-5. Kyvig, David E. Daily Life in the United States, 1920-1939. (Westport, Connecticut: Greenwood Press, 2002), 92. Gross, Ernie. Advances and Innovations in American Daily Life, 1600s-1930s. (Jefferson, North Carolina: McFarland & Company Inc., Publishers, 2001) 92. Thurman, Judith. “If You Ask Me: Etiquette through the Ages.” The New Yorker, Feb. 18, 2002. Ames, Kenneth L. Death in the Dining Room. Philadelphia: Temple University Press, 1992. Fenwick, Millicent. Vogue’s Book of Etiquette and Good Manners. New York: Conde Nast Publications with Simon & Schuster, 1969. Gross, Ernie. Advances and Innovations in American Daily Life, 1600s-1930s. Jefferson, North Carolina: McFarland & Company Inc., Publishers, 2001. Kolbert, Elizabeth. “Place Settings.” The New Yorker, Oct. 20, 2008. Kyvig, David E. Daily Life in the United States, 1920-1939. Westport, Connecticut: Greenwood Press, 2002. Levenstein, Harvey, A. Revolution at the Table. New York: Oxford University Press, 1988. Schlesinger, Arthur M. Learning How to Behave. New York: The MacMillan Company, 1947. Vanderbilt, Amy. Amy Vanderbilt’s New Complete Book of Etiquette. Garden City, New York: Doubleday & Company, Inc., 1963. I want to credit this article in a book I am writing. How should I credit the source?